St. Martin's Press, 9781250111838, 464pp. 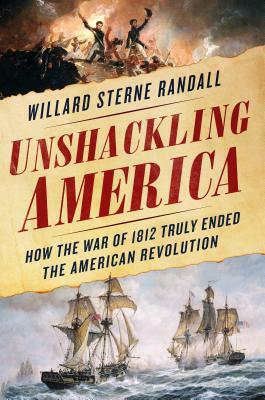 Unshackling America challenges the persistent fallacy that Americans fought two separate wars of independence. Willard Sterne Randall documents an unremitting fifty-year-long struggle for economic independence from Britain overlapping two armed conflicts linked by an unacknowledged global struggle. Throughout this perilous period, the struggle was all about free trade. Neither Jefferson nor any other Founding Father could divine that the Revolutionary Period of 1763 to 1783 had concluded only one part, the first phase of their ordeal. The Treaty of Paris of 1783 at the end of the Revolutionary War halted overt combat but had achieved only partial political autonomy from Britain. By not guaranteeing American economic independence and agency, Britain continued to deny American sovereignty. Randall details the fifty years and persistent attempts by the British to control American trade waters, but he also shows how, despite the outrageous restrictions, the United States asserted the doctrine of neutral rights and developed the world’s second largest merchant fleet as it absorbed the French Caribbean trade. American ships carrying trade increased five-fold between 1790 and 1800, its tonnage nearly doubling again between 1800 and 1812, ultimately making the United States the world’s largest independent maritime power. Willard Sterne Randall lives in Burlington, Vermont. An award-winning journalist, he is now a Distinguished Scholar in History and Professor at Champlain College. He has written six biographies of Founding Fathers or their antitheses. "[A] lush, readable account of the war in all its complexity. Admirers of Mr. Randall’s biographies will not be disappointed with the intertwined tale the author weaves in Unshackling America: The events of the war unfold in an accessible, chronological narrative, peppered with lively vignettes from the front lines of battle, the drawing rooms of Washington and Europe, and the everyday experiences of ordinary noncombatants." "Far from another study of the War of 812, Willard Randall's fast-paced narrative sweeps across the history of America from its mid-1700's status as a colonial satellite through the Revolution against the other country and the growing pains of Federalism into the second and final war with Britain...The interweaving of the personal, political, military and geopolitical make Unshackling America a fine portrait in incipient American nationhood. That era was plagued by political rancor, trade problems, large personalities, refugee crises, and what seemed an unwinnable war. Sound familiar?" "Randall brings to life the violent skirmishes that played out in the name of trade on sea, lake, and land."